Team Hot Wheels™ Sets New World Record With 332 ft. Distance Jump at Centennial Indianapolis 500 | Mattel Inc.
INDIANAPOLIS--(BUSINESS WIRE)-- Today as part of "IZOD Presents Hot Wheels Fearless at the 500™," Team Hot Wheels™ Yellow Driver Tanner Foust successfully landed a ramp-to-ramp distance jump of 332 feet. Foust, a three-time X Games gold medalist and professional stunt driver smashed the previous world record by an impressive 31 feet at the 100th anniversary of the Indianapolis 500. "Fans witnessed not only a record-breaking jump today, but also an incredible childhood fantasy come to life which engaged multiple generations," said Simon Waldron, vice president of marketing for Hot Wheels®. 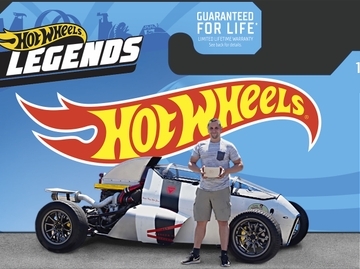 "Hot Wheels has a deep and rich history in racing that spans over 40 years and there was no better global stage than the Indy 500 to create this once-in-a-lifetime experience." Spectators at the Indy 500 watched anxiously today as a masked mystery driver sped down a 90 ft. ramp, suspended on an enormous 10-story high door (100 feet tall) and flew across the infield of the Indianapolis Motor Speedway. Moments after the jump occurred, Foust was revealed as the mystery Team Hot Wheels™ Yellow Driver. The "IZOD Presents Hot Wheels Fearless at the 500™" jump brought to life the iconic Hot Wheels® V-Drop® track set boys have played with on their bedroom doors for years. 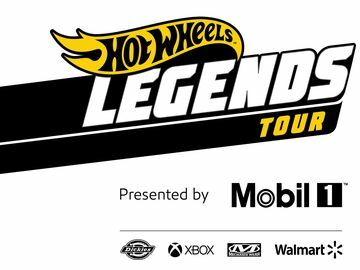 The stunt will be nationally televised today at 3:30 PM EDT in a 30-minute ABC Special highlighting various Team Hot Wheels™ stunts, including the new world record distance jump. Additional behind-the-scenes footage and interviews with Tanner Foust will be available on Facebook after the ABC Special. Complete footage of the jump will be available on www.youtube.com/hotwheels at 4:00 PM EDT. "As a kid playing with Hot Wheels I could only dream of experiencing something as outrageous as a life-sized V-Drop track set, and today it became reality," said Tanner Foust, Team Hot Wheels Yellow Driver. "There's a lot that goes into being on Team Hot Wheels and the training and testing leading up to the jump gave me the confidence needed to push the mechanical and mental limits of the challenge and land the world-record title." Foust is a professional stunt driver with a record number of top finishes and thrilling behind-the-wheel moments captured on-screen. In addition to being a three-time X Games gold medalist and two-time Formula Drift champion, Foust is also an on-air host for Top Gear USA on HISTORY. He recently became the first American ever to win a round of the FIA European Rallycross championship in his Rockstar Energy Drink Ford Fiesta. His professional stunt driving credits include Fast and Furious: Tokyo Drift, Dukes of Hazzard, Bourne Ultimatum, Iron Man 2, and the remake of Red Dawn.